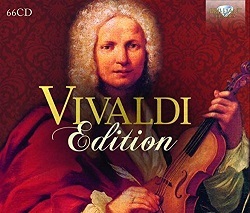 Since I reviewed the 40-CD Brilliant Classics Vivaldi Edition and made it Bargain of the Month some time ago there have been several changes for the better. Even then I noted that my review set differed slightly from the product which was out on sale and that one CD was not what it purported to be. Three changes certainly represent improvements: the box has now been expanded from 40 to 66 CDs, still at a very attractive price, around £70; there is now an online pdf document containing notes and texts, though not all the texts are offered with translations. Best of all Brilliant have replaced some decent but hardly outstanding performances of the Op.3, Op.4 and Op.8 concertos with more recommendable recordings. All the new additions are improvements and little that has been omitted is any great loss, though I do regret that the stylish and lively performances by Musica ad Rhenum of Concertos for diverse instruments have not been carried over. I’ve suggested some alternatives but you wouldn’t need to buy too many of these to exceed the price of the Brilliant box. They may, however, prove useful to those who bought the earlier box and would like to supplement it. All of that means that the box compares favourably with the Decca Vivaldi Masterworks collection of recordings featuring the AAM with Christopher Hogwood, the New London Consort with Philip Pickett and the Australian Brandenburg Consort with Andreas Scholl: 29 CDs for around £90, with a download for around £48 (mp3) or £59 (flac). You may have some of those recordings if, for example, you followed my recommendation to buy the Decca Baroque Era 50-CD set or the download of Volume 2 of that set when it was available. Baroque Era contains cello concertos and sonatas, the Op.6 concertos, The Four Seasons (but not the rest of Op.8), oboe concertos, Stabat Mater and Nisi Dominus. CD1-CD19: all Vivaldi’s concertos and sonatas published with opus numbers, Op.1 to Op.12. I’ve dipped into these via Qobuz and been very impressed. I had intended to purchase the 2-CD Op.8 set, available separately, but didn’t need to because I received it for review and was sufficiently impressed to make it a Recording of the Month. That set is likely to be one of my main choices when I want to hear The Four Seasons alone or the rest of the Op.8 collection. (95045 – review). I did purchase and enjoyed the download of the Op.7 concertos, which I see that Johan van Veen also recommended as an excellent way to fill a gap in a Vivaldi collection (95044, 2 CDs – review). At least some of the concertos in this set are not authentic but all the music is very likeable in these vigorous performances. If you own the earlier box and would like to add just the 20-CD set of Op.1 to Op.12, with the Cello Sonatas as a bonus, it’s also available separately (95200, target price £40). You may see this set offered as a download at what seems an attractive price, around £8 for mp3 or £9 for lossless, but be aware that it’s been divided into three sections and the price is for just one section.  Trio Sonatas, Op.1/1, 3, 4, 7-11 (Sonate da camera a tre) including La follia: Naïve OP30535, performed by L’Estravagante – review by Johan van Veen. Stream or download from classicsonlinehd.com (with booklet).  For the performances of six of these sonatas by L’Estravagante (Naïve OP30535, slightly misleadingly labelled Concerti da Camera) please see Download News 2013/11.  Chandos CHAN0689 – review – an earlier recording with Federico Guglielmo and L’Arte dell’Arco, with Christopher Hogwood directing. Download from theclassicalshop.net (mp3 for £10 and lossless for £11.99, with pdf booklet).  Channel CCSSA36515 (effectively 2-for-1) Brecon Baroque/Rachel Podger (period instruments). Review.  Double Decca E450782 (2-for-1) AAM/Christopher Hogwood (with Op.6) (period instruments). E4757693, Op.3, Op.4, Op.8 and Op.9 is now download only.  Virgin 6484082 (4 CDs budget-price) Europa Galante/Fabio Biondi (with Op.8) (period instruments). See review.  La Stravaganza, Violin Concertos, Op.4 (2-for-1): Double Decca 4448212 ASMF/Neville Marriner (modern instruments). Channel CCS19598 or CCSSA19503 (SACD) (2-for-1): Rachel Podger with L’Arte dei Suonatori – review.  Violin Concertos, Op.6: if you bought the Decca Oiseau-Lyre Baroque Era 50-set when I recommended it, the AAM/Christopher Hogwood recording is included there, with The Four Seasons, etc. (4786753, around £130). Volume 2 of that set (25 CDs) is no longer available to download.  Il Cimento dell’armonia e dell’invenzione, Violin and oboe concertos, Op.8 (including The Four Seasons, Op.8/1-4): Linn CKD365 (2-for-1) Pavlo Beznosiuk with Avison Ensemble – review – Download News 2011/2.  Flute Concertos, Op.10 – see Op.3 for 9-CD DG box set.  For the Op.11 and Op.12 concertos the only serious alternatives are immured in a 20-CD or a 28-CD box set. CD20-CD22: the complete Oboe Concertos, with Pier Luigi Fabretti (oboe), also available separately on 94654, 3 CDs, around £10. Johan van Veen recommended this set despite the doubts about the authenticity of some of the concertos – review. Some of these performances are duplicates of those in the Op.7, Op.8 and Op.11 collections. CD23-CD26: the complete Cello Concertos, with Francesco Galligioni (cello), also available separately on 95082, 4 CDs, around £11. I’ve dipped into these via Qobuz and found them not only more complete than the performances on CD13-14 of the older set but also preferable in performance terms. The new Brilliant set also contains a performance directed by Guglielmo of the opera Ottone in Villa (CDs 54-55, also available separately 94105, 2 CDs around £8.50). Bargain of the Month – review. The pdf document referred to above contains the Italian text; there’s no translation, but that’s preferable to the eclassical.com download of the alternative Naïve recording: at $24.23 it’s less expensive than the CDs but it comes without any booklet (OP30493 – review). There’s a third recording, on Chandos (CHAN0614 – 2 CDs or download in mp3 or lossless, with pdf booklet, from theclassicalshop.net). I plan to compare these three recordings in a forthcoming edition of Download News. It’s only recently that Vivaldi’s operas have been recorded but there’s now a great deal more where the Naïve recording came from. If Ottone in Villa and Il Teuzzone (below) have given you a taste for more, however, you may first wish to try out a recital of arias from various Vivaldi operas beautifully sung by Emma Kirkby with the Brandenburg Consort and Roy Goodman (Hyperion Helios CDH55279 – still available from some dealers for around £6.50 or download from hyperion-records.co.uk for £7.99). Philippe Jaroussky’s many admirers – I’m definitely one – should note two Vivaldi recordings: Heroes contains virtuoso performances of fifteen opera arias (Erato 3634142, mid-price). Virtuoso Cantatas offers far better performances of the secular cantatas RV670, 671, 674, 676 and 677 than are to be found in the Brilliant box – see below for the weak links in the set – plus two operas arias (Erato 5457212, mid-price). If the recordings by L’Arte dell’Arco in the Brilliant set appeal, there’s more from them in the form of a set of Six Violin Concertos for Anna Maria on CPO 7770782. CD27-CD29: new recordings of Concerti da Camera, or Concertos for Small Ensemble performed by Collegium Pro Musica, including Federico Guglielmo and other members of L’Arte dell’Arco, also available separately on 94332, 3 CDs for around £10. I dipped into this set as streamed from Qobuz and enjoyed it, but please note that the download comes without booklet and costs as much as the CDs. My colleague Johan van Veen reviewed this on his own web-site; I completely endorse his assessment of it as ‘a very pleasant and compelling recording of some of Vivaldi’s finest music’. It’s a shame that the original single-CD set from Il Giardino Armonico was not also included, even though it would entail duplication – I could gladly have substituted it for some of the vocal recordings on the later discs common to both sets. Two other recordings of these chamber concertos are worth mentioning. The collection of Seven Concertos performed by a distinguished team including Marion Verbruggen – review – is no longer available, as it used to be, as a superb bargain but it’s well worth paying $14.62 to download from eclassical.com (mp3 and lossless, but no booklet). Another very fine collection from Chandos Baroque Players opens with RV95, La Pastorella, which gives the collection its title. (CDH55102 – still available from some dealers for around £6.50, or download from hyperion-records.co.uk, with pdf booklet). CD43: Recorder Sonatas (Accademia del Ricercare – see below, CD46). CD47: Oboe Sonatas (Ensemble J.M. Anciuti – also available on 94417 – review by Johan van Veen). I streamed this, with booklet, from Qobuz and enjoyed it but the download is over-priced at £10.79 when the CD costs around £6.50. CD48: Recorder Sonatas (Collegium pro Musica – also available on 95077). Actually by Nicholas de Chédeville (1705-1782), Il Pastor Fido, Op.13/1-6, though previously attributed to Vivaldi. By coincidence BIS have just released a very well-filled (85-minute) SACD and 24-bit download of Sonata No.6 from this collection, together with music by Philidor, Dieupart, Marais, Hotteterre, Blavet and Chéron, performed by Dan Laurin (recorder), Anna Paradiso (harpsichord) and Domen Marincic (cello) (BIS-SACD-2185). Look out for review of the download from emusic.com in a forthcoming Download News. CD49: Flute Sonatas (Collegium pro Musica). Two of the Chédeville sonatas from Il Pastor Fido are repeated from CD48, with the flute replacing the recorder. CD56-CD57: Juditha Triumphans (dramatic oratorio) directed by Federico Maria Sardelli – also available as Tactus TC672290 (2 full-price CDs). For a stand-alone version you might prefer the Hyperion 2-CD set from The King’s Consort (CDA67281/2 – CDs or download with pdf booklet from hyperion-records.co.uk, also available as CD4 of the Complete Sacred Music, CDS44171/81, 11 CDs or download from hyperion-records.co.uk). Review. The Hyperion collection is particularly valuable because the performances are greatly superior to those contained on CD59-CD61 and CD65-CD66 of the Brilliant box (below). For a stand-alone version there’s also a Naïve recording directed by Alessandro de Marchi, either complete on two CDs (OP30314 – review) or on a single-CD set of highlights (OP30450). CD58: Ostro picta, Spina armata; Introduction and Gloria, RV589; Magnificat in g minor, RV611 (Venice version) directed by Ludwig Güttler: available separately as 95022. This transfer from a Berlin Classics recording offers a better performance of Ostro picta than you’ll find on CD65 – one of my few serious disappointments: see below – but there’s a better performance still of both works, with Nisi Dominus, on Hyperion CDA66849 – Volume 10 of the 11-CD set which I’ve already recommended (above). For the Naïve recording of both settings of the Gloria, RV588 and 589, see below. CD62-CD64: recordings of Cantatas for soprano and basso continuo, licensed from Tactus, some of which replace less satisfactory recordings by the Netherlands Bach Consortium, though some of the latter have been retained (see below). CD37: Concerti per archi (string concertos, from CD20) performed by Concerto Italiano and Rinaldo Alessandrini, who have since made many highly recommendable Vivaldi recordings. See also below for the three further selections of these string concertos and additional suggestions. CD42: Opera Overtures performed by Modo Antiquo/Federico Maria Sardelli (as per original CD11). CD40: Concerti per molti istromenti (Modo Antiqua, from CD25). For another collection of these concertos with several instruments there’s an excellent selection from The King’s Consort on Hyperion Helios CDH55439 – review – Download Roundup August 2012/2. The whole Helios series has recently risen from budget to full price but dealers may still have this for around £6.50; otherwise it can be downloaded for £7.99 from hyperion-records.co.uk. Only two concertos overlap with the Modo Antiqua recording. CD44-CD45: stylish performances of the Cello Sonatas recorded by Jaap ter Linden (cello) with Lars Ulrik Mortensen (cello) and Judith-Maria Becker (cello) (from CD27-CD28, available separately on 93567, 2 CDs, around £8.50). Another inexpensive and very worthwhile set of the cello sonatas comes on a Hyperion Dyad two-for-one set from David Watkin and members of the King’s Consort (CDD22065 – around £10.50 on CD or download for £8.99, with pdf booklet, from hyperion-records.co.uk). Review. CD30: Otto concerti solenni from La Magnifica Comunità (from CD5). Stylish performances of attractive music, well recorded. Of some of these concertos there is no other current recording. CD31: An eclectic and attractive collection of seven Recorder Concertos from Erik Bosgraaf and Cordevento, available separately on 93804. By design or good fortune there is no overlap with the new set of Flute Concertos on CD39, performed by Federico Maria Sardelli (transverse flute) with Modo Antiqua. The full-price Tactus original of this recording is available separately, minus RV783; I listened to this as streamed from Qobuz, with booklet. (TC672202). I’m surprised to see that the very enjoyable set of Flute and Recorder Concertos on Harmonia Mundi 2-for-1 HMX2907340/41, with Janet See (flute) and Marion Verbrüggen (recorder), the Philharmonia Baroque Orchestra and Nicholas McGegan is now download only, available at budget price from Presto. There’s some overlap with the recordings in the Brilliant box but I recommend it as an inexpensive adjunct. Stream from Qobuz but the download there is too expensive. Chandos have three volumes of Concertos for strings, performed on period instruments by Collegium 90 and Simon Standage. I won’t list the details because you can follow them up on the Chandos website by clicking on the catalogue number: CHAN0647 – review – CHAN0668 and CHAN0687 – review. If you wish to download them, the Chandos page will take you to the appropriate equivalent at theclassicalshop.net. RV130 (al santo sepolcro) in particular pops in many collections, including another Chandos recording of works for soprano and orchestra (CHAN0714 – see below). It also features on an enjoyable selection of concertos for strings performed by L’Arte dei Suonatori (BIS-CD-1845 – review – DL Roundup February 2012/1). For fans of 24-bit sound it can be downloaded from eclassical.com for $12.94, with pdf booklet: also available for $9.25 in mp3 and 16-bit. If you like the Concertos for Strings as performed by Concerto Italiano and Rinaldo Alessandrini on CD37, as I believe you will, there are further recordings by them of these works on Naïve OP30377 – Download News 2013/11 – and 30554 – review. Both can be downloaded from eclassical.com – here and here – or purchased on CD. Following the eclassical.com links will show you the contents of each album but there’s no booklet with either. CD41 contains the same mixed batch of two Mandolin Concertos and the Cello Sonatas, RV42, 44 and 45, with Viola de Hoogh (cello) as on the earlier CD26. It’s rather an odd choice when superior performances of all the cello sonatas are available on CD44-45 and RV460 is included with the complete oboe concertos and the Mandolin Concerto RV425 also appears on CD35. CD46: Sonatas and Trios for flute(s) and continuo (Conserto Musico, from CD29). These arrangements, some made by other composers, are supplement by an extra set performed with recorder(s) by Accademia del Ricercare on CD43, attractive performances which I sampled from Qobuz, with booklet, though I can’t recommend downloading for £10.79 when the CD can be found for around £6.50 (94173 – review). CD50: Bach’s organ transcriptions of Vivaldi concertos in stylish performances by Elena Barshai, though her own arrangements of some of them and the chosen registration are a little heavy for my taste. The earlier set didn’t specify the organ: it is, in fact, that of Arlesheim Cathedral in Switzerland. CDE51-CD53: Il Teuzzone (from CD30-CD32). We now have the Italian text on the pdf download to which I have referred above: there’s no translation but there’s a fairly detailed online synopsis from Stanford. For a stand-alone recommendation I’d prefer the Naïve recording conducted by Jordi Savall (OP30513 – review). That can be downloaded from eclassical.com for a very reasonable $28.86: no booklet but the Brilliant pdf with the Italian text is free to all comers. Stream from classicsonline.com, again without booklet, but the download is overpriced at £23.99 when the CDs are on sale for only a few pence more. (Even less, at £19.40 on special offer as I write). If Qobuz are still offering the Naïve recording, with booklet, for £5.49 when you read this – surely a mistake? – snap it up. Inevitably such a large collection contains some disappointments, carried over from the earlier box. My only serious misgivings concern the contributions towards the end of the set from the Netherlands Bach Collegium directed by Jan Leusink. Several of these from the earlier set have been replaced with much better performances from Modo Antiquo, licensed from Tactus, on CD62-CD64. Even so, for Lungi dal vago volto (CD64), Emma Kirkby with Tafelmusik and Jean Lamon is preferable. (Hyperion Helios CDH55190, with In turbato mare, Magnificat, RV610, and three concertos – from hyperion-records.co.uk, CD or download). The CD is available only from the Hyperion Archive Service. At best the remaining Bach Collegium recordings are rough and ready but CDs 65-66 (39-40 of the older set) are disastrous, with both soprano and alto soloists, especially the latter, over-parted in these cantatas. I must have been in a very generous mood when I wrote that you would not be seriously disappointed with Leusink’s team. Leusink and his team also contribute the Gloria, RV588 and Stabat Mater (CD 59), Dixit Dominus and Nisi Dominus (CD 60) and the Magnificat in g minor (CD 61) as per CDs 36-38 of the older set. Here, too, the solo singing requires much greater tolerance than I indicated in my earlier review. That rules less than 10% of the set out of court but it does mean that you should look to supplement the box from other sources. For the Gloria there is a wide range of choice to suit all tastes but I particularly like Rinaldo Alessandrini’s vigorous performance with Concerto Italiano on Naïve OP30485, coupled with the other Gloria, RV588. Download from eclassical.com, mp3 and lossless, but no booklet. That also includes a much better performance of Ostro picta, armata spina than you will find in the Brilliant box. There’s also a recent recording of the Gloria and Magnificat, with Lauda Jerusalem and Lætatus sum, from Hervé Niquet and Le Concert Spirituel on Alpha 222. I recommended that from an mp3 preview in Download News 2015/11; it’s now available in better sound (mp3 and lossless) from eclassical.com. Better still, why not go for the Hyperion complete 11-CD set of Vivaldi’s Sacred Music (CDS44171/81, £34 on CD from hyperion-records.co.uk, where it’s also available to download in mp3 or flac). Individual discs from this set are available from the Archive Service or as downloads but the complete set is almost as notable a bargain as the Brilliant box. I’ve already mentioned two Philippe Jaroussky Vivaldi albums; there’s another for his fans to consider: the admirable Pietà contains Stabat Mater, Longe mala, Claræ stellæ, Domine Deus from the Gloria and Salve Regina (Erato 2564625810 – review – review). The Naïve recording on which he and Marie-Nicole Lemieux sing Nisi Dominus and Stabat Mater has been reissued at mid-price (NC40019 – review of earlier release). The short playing time (42 minutes) means that the eclassical.com download is especially good value at $7.53 (mp3 and 16-bit lossless) or $11.29 (24-bit) but there’s no booklet. Catherine Bott offers very fine performances of In furore iustissimæ iræ and Laudate pueri Dominum on mid-price Chandos CHAN0714. She’s accompanied by the Purcell Quartet who add three chamber concertos. If you are thinking of downloading, the eclassical.com lossless version, at $9.98 is slightly less expensive than theclassicalshop.net (£7.99); it comes without booklet but that’s available to all comers from Chandos. 66 CDs may look like a lot of Vivaldi to take in, especially for beginners. It took my generation years to look beyond The Four Seasons but I have suggested some areas in which the Brilliant box could usefully be supplemented in various places. You wouldn’t, however, need to buy more than a handful of the alternatives to find yourself approaching the price of the Brilliant box. Just be warned that Vivaldi can be addictive and that if you go for this budget-price set you may find yourself dipping into some of the other collections mentioned and others which have been reviewed on MusicWeb-International and in my regular Download News. As I was converting this review for the web I was listening to another very tempting recent offering: The Young Vivaldi – concertos and trio sonatas performed by Modo Antiquo/Federico Maria Sardelli (Sony/Deutsche Harmonia Mundi 8875127852). I listened as streamed from Qobuz but their download is uncompetitive at £10.29 when the CD can be found for less – target price £9.99. Otto concerti solenni, RV197, 85 Anh, 155, 316, 185, 247, 292 and 134. Juditha triumphans devicta Holofernis barbarie RV644: Oratorio in two parts.